Every great fighter needs a nemesis to challenge him, and long ago Nonito Donaire’s many critics picked one for him in WBA champion Guillermo Rigondeaux. Two equal champions battling for glory? That sounds much more exciting than the sobering reality that Rigondeaux is a massive underdog. What are Donaire’s real chances of surviving Rigondeaux? Donaire’s many critics contend that Donaire’s amazing career was really just smoke and mirrors, masking the fact that he actually fought second-raters and outright bums. Some “bums” there. Combined, Donaire’s last four opponents boast an impressive 55-8-2 record in world title fights. And Rigondeaux? His last five opponents clock in at 2-2-2, with questionable interim titles generously included in the total. I don’t see it. Rigondeaux MUST enter this fight a long shot against the vastly more experienced Filipino. And yet for all his victories, Donaire gets criticized as the unaccomplished paper champion in this matchup. So why am I hearing so much about the trouble that Donaire’s in? As far as I’m concerned, Rigondeaux’s the one in trouble! Why does the burden of proof appear to rest on people like me who favor Donaire and defend his record? Donaire victim Toshiaka Nishioka was demeaned as an unworthy geriatric. I point out that Nishioka was on an 8-year winning streak, and the defending champion with title victories over talents like future champion Jhonny Gonzalez. Not exactly bum material there. Jorge Arce was admittedly past his prime and a few weight classes above his ideal fighting weight – but he was only one year removed from his last world title. Wilifredo Vasquez was a legitimate champion, and Donaire’s easy UD over the freakishly tall Jeffrey Mathebula showcased an underrated boxing IQ. Still say they were garbage? Then deny this – ANY ONE of these men would be the highlight of Rigondeaux’s career by leaps and bounds. Hell, I’m not even including Donaire’s early victories over other champions like Vic Darchinyan, Hernan Marquez, Vladimir Soryenko, Omar Andres Navarez and Fernando Montiel. This is EXACTLY the kind of record you expect from a star with mega-hype in front of him! By contrast, none of Rigondeaux’s victims had a single successful title defense. They actually deserved the “paper champions” label often inexplicably applied to victims of the Filipino Flash. Since entering the title picture, Rigondeaux has blasted out club fighter Willie Casey in a single round, narrowly slipped by Ricardo Cordova, and savaged virtually unranked fighters Teon Kennedy and Robert Marroquin. No knock on the competition, but if you know these names, then you’re probably Rigondeaux fans. Are you telling me that Donaire couldn’t easily handle these guys as well? Could you imagine the groaning if Donaire had fought Willie Casey, for example? A double standard quickly emerges. I’m seen Rigondeaux fight, and I’m impressed. I love how he moves, how he seems to flick hooks like other fighters flick jabs. And I’m impressed with how much he’s done in 11 fights. But I have to wonder how much stems from his opposition. Rigondeaux claims the entire division is afraid of him. Maybe that’s true. 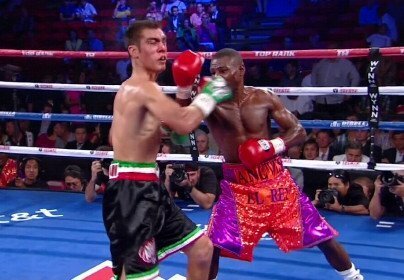 Maybe ugly politics, missed opportunities and bad schedules have denied Rigondeaux his shot against the world elite. The point is, Rigondeaux’s lack of experience against champion caliber isn’t his fault – but it is his problem. His one opponent with serious world title experience was Ricardo Cordova – coincidentally, the most difficult fight of Rigondeaux’s career. Why does no one mention that fight, by the way? Last year I heard reasonable arguments that Donaire rarely fought taller fighters, meaning that the 5’5 Rigondeaux would push him from his comfort zone. That argument died when Donaire easily bested the aforementioned 5’11 Mathebula, a victory Donaire gets no credit for. I’ve also heard that Donaire cannot handle defensive-minded fighters, as evidenced by his fight against Navarez. Did you watch that fight? Donaire won every second of it! I can still be convinced otherwise. Obviously Rigondeaux gets his chance to make a much more compelling case in the ring this weekend. But I can also tell you HOW to change my mind. Ringondeaux must show me something that Donaire can’t do.